The sun was shining, the birds were chirping, and all felt alive. Spring is springing finally and though it has been a long Winter I feel tougher for making it through. It is making every moment that much sweeter right now. For instance while I was cooking dinner last night the sun was beaming through the kitchen windows on to my legs. It was the purest warmth I have felt in a long time. There was this feeling of thawing out that crept over my body. Funny how such small things can seem so precious when they have been taken away for so long. The best thing about the onset of the warmer weather (warm is 65!!! You know how warm that feels to this soul of mine? like 90!) is being able to get back to the dirt. Ever since I was little I loved being outside. Growing up in Kentucky the days were warm longer and I would be outside from sunrise to sunset. In college I did the same and now as an adult I realize how even more vitally important it is to be wandering, exploring, and breathing in the fresh air. I could very easily spend my day working in my garden, hiking, and then enjoying the evening with a good dinner made from a fresh harvest with a few of those I love. That is a perfect day to me. I know it sounds very simple, but there is a purity and rawness that comes from the Earth that I think we too often forget. We get busy and we get focused on so many other things that we forget what it means to be exhausted from a good days adventure, the fresh air, and cooking our own meal that we gathered with our hands. I honestly had really forgotten this desire throughout this Winter. I felt this contentment and fullness in life when we were on the farms in Raleigh. When I came home I felt empty again and I couldn’t figure it out really until the last few days when I saw my garden plot reveal itself from beneath the blanket of white. I saw the green tops of the onions I planted last year that were now begging desperately for the sun that I craved as well. I believe in eating healthy and eating wholelistically but what I believe in more is the ground and the things that we can provide for ourselves when we take the time to tend to what we were given. This is why a company like Clyde Oak so deeply resonates with me. When I was growing up I wanted to be an earth scientist. Just ask my parents. I collected every cool rock I found. I loved the cliffs that fell deep in to the Kentucky river (I still do) and I was so easily amazed by how the earth moved and changed. Weather was always fascinating to me and never frightening. I still love the energy of an oncoming summer storm and the way the earth smells at different seasons. Yesterday when we hiked it smelled like Spring for the first time. You know that smell? So though I love fashion and I love design the one thing I love more is the Earth and being apart of it. In that way I feel like I never gave up my desire to study the earth when I gave up at the realization I was going to have to pass Chemistry. Instead I feel what I found was that what I naturally am good at allows me to explore my other passions in a free and wonderful way. I have a blog where I can share about our garden and what I love about the Earth, and I can work with great companies that believe in the same thing. That makes me feel really lucky. That being said, this weekend I plan to get back to the dirt. To fix the mistakes I made last year in the garden. 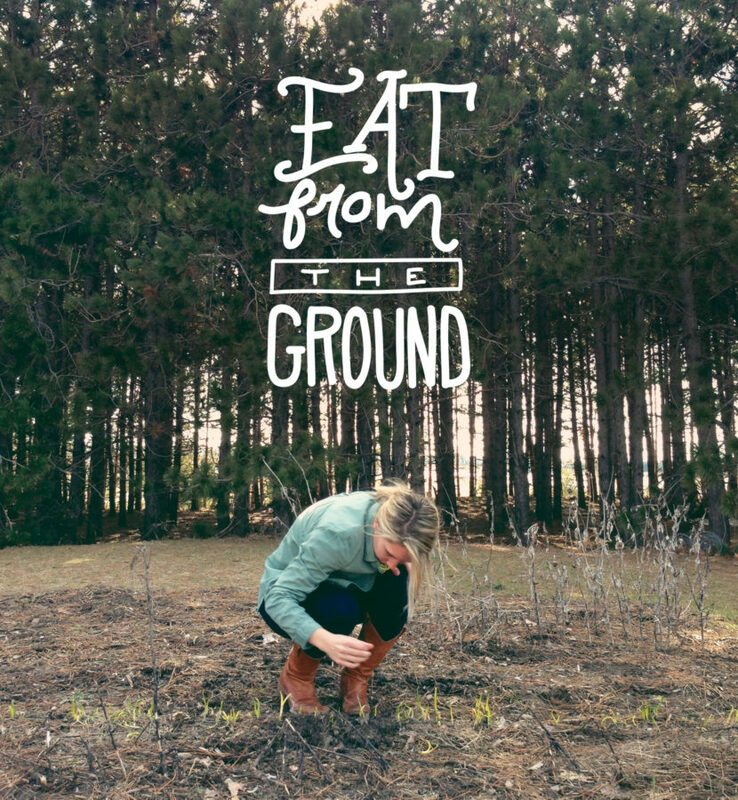 Work harder to produce the food I want to eat from the dirt and tell the story to you all along the way. I have promised myself that this year will be the year I really put forth the effort to talk about this bit of our life. Mike and I both feel passionate about what our garden means to us. We believe more people can do what we do no matter the amount of space they have. We also believe that the best thing we can do for ourselves, the world, our community, and to voice our concerns about the growing food problems in our country is by communicating and sharing our little garden with you all. We want to talk about how we do it, the mistakes we make, how we eat the food we grow, and everything else you all want to hear. So you have something specific you want…let us know!! We will be working with Clyde Oak to produce this content and be showing every step we can along the way. So even those of you who have a small studio apartment in a big city we want to help you find a way to grow things yourself as well. We believe it is possible for everyone. So I hope you all will enjoy what we are working on in for this feature. I am just so excited to share a part of my life that feels so intimate in many ways to me. My 20×15 foot plot has always been my happy place and where I begin and end my days in the Summers. It is the one place there is no judgement, no demands, no questions, and the one place that always makes me successful. To hold a freshly turned cherry tomato or pull a radish from the ground reminds me that no matter what happened the rest of the day I was a success in that space. That’s really beautiful to me. What do you plan to do this weekend? Have you started your garden? Does it feel like Spring yet? you make me want to stake my claim on a plot of land so badly! if you need someone to experiment with planting and growing in a small apartment in the city, let me know! This is a beautiful post Megan! Your words resonate deeply with me as I feel the exact same way. I built a very large garden last year (we live on a farm so space was no issue) and the rewards I felt each passing day made all the hardwork seem more than worth it. Going out and gathering ingredients for dinners was an event for me that made me giddy..and I can’t wait to do it all over again this year. Like you I have learned from my mistakes last year and I will go on to grow and learn and develop again and make even more mistakes to learn from for next year. This week I sowed my first rows of peas, radishes, potatoes and arugula so this weekend I will be tending to them while tilling up the rest of my garden (2,000sq ft) for later planting. Am looking forward to all of your future posts!! Happy gardening! I can imagine how you feel about your garden cause mine makes me feel the same way! I grew up in a big city and never had a plot, a backyard, nor even a balcony… But now that I live in an apartment with a small garden I just love it. To bury my hands in the dirt gives me such a peace, I just think about soil, plants when I’m there. And all the problems stay away from my garden, it’s my peaceful oasis. I love everything about this. I, too, am aching to get back in the dirt. My husband and I just moved into a small house, and I am over the moon with excitement about starting our first set of gardens together. It’s too easy to lose a connection with the earth, and I’m looking forward to digging in, getting my hands dirty, and feeling kinship with our environment again. Looking forward to all your upcoming posts. Sounds wonderful. I don’t plant a full garden but do plant an herb garden every spring and love it. This is beautiful, and so inspiring. Thank you. It’s great to read about this topic, especially from a realistic point of view. People don’t easily relate to huge garden owners with killer landscape design skills and terrific plant/flowers range. As a lover of flowers and plants but totally ignorant of “get your hands into dirt process” I’d love to know the basics, like where do you start from? How do you plan your first few things and how do you take care of them? Thanks in advance Megan. Have a great week!